Black Lawn Beetle can be a problem for owners of all lawn types, including Buffalo grass lawns. A native of Africa, the Black Lawn Beetle goes through various life stages, each of which can cause at least some damage to our lawns. But with this possible damage also comes benefits. In every case where the homeowner has asked if the Black Lawn Beetle was damaging a lawn, it has never once been found to be true. Indeed these lawns often can have the Black Lawn Beetle, which is very common, but the responsibility of poor lawn health may be down to the lawn owner themselves. In most cases the lawn owner wasn’t keeping their lawn care up to scratch, and went looking for a culprit to blame. And the most common culprit of all is the common Black Lawn Beetle. The fact is that a Buffalo lawn would need to be very heavily infested with Black Lawn Beetles for any damage to be seen. Most lawns will only ever have very small numbers of these beetles who are incapable of doing damage. Besides this, at the times of year when the Black Lawn Beetle is most actively chewing on the roots of our lawn, our lawn is growing at its maximum speed and health. Therefore it would very quickly repair any minor damage, often without the lawn owner ever noticing. And once our lawns go dormant over the colder months, so too does the Black Lawn Beetle. Black Lawn Beetles in lawns can in fact be of great benefit as they burrow through the soil and do a wonderful job of naturally aerating it. The Black Lawn Beetle is very easily killed in Buffalo grass by the use of simple pesticide dusts which are commonly available for a small price. The dust is applied to the lawn and watered-in. 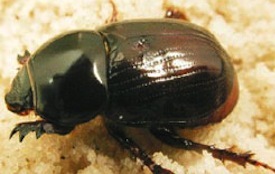 The pesticide works its way through the soil, killing the Black Lawn Beetle as a result. However, before doing this, we would recommend rethinking this approach, and would encourage the lawn owner not to proceed with treating the Black Lawn Beetle. The Black Lawn Beetle do provide benefits to the lawn’s soil, they do very minor damage which in most cases will never be noticed, and in most cases we’re simply pouring pesticides into the environment for no benefit, or in fact, loss of benefit. Having said that, the Black Lawn Beetle should be treated in Buffalo grass, and all other lawn types at any time they can be seen to be growing into large numbers. At which time they can indeed overrun a lawn and cause damage, though, such cases will be rare.